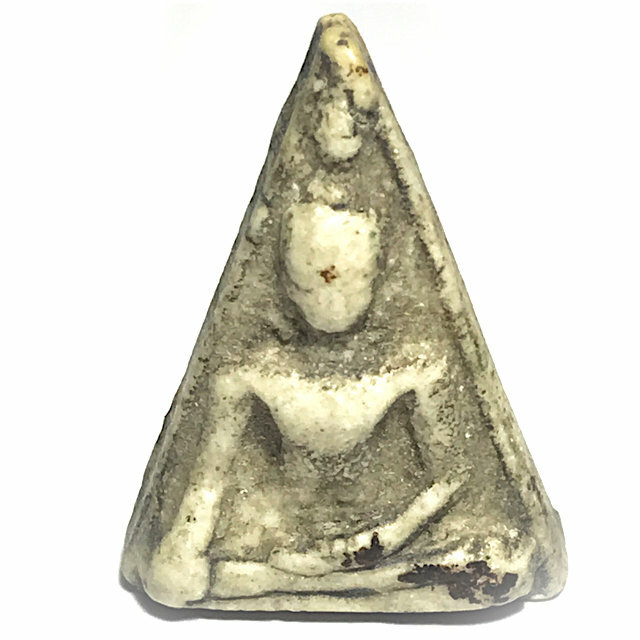 Somdej Pra Nang Paya Kru Wat Tap Khaw, 'Nuea Graeng' (stone hard), with smooth subtle features, and the classic aspects of a true Pra Niyom Master Class amulet of the Pra Kru Hiding Place Amulet Category. The Pra Nang Paya was found to have various Pim in the hiding place, from different eras. This exhibit has the visible presence of Muan Sarn Sacred Powders used by Somdej Pra Puttajarn (Dto) Prohmrangsri, and are identical in characteristics to those found in the Pra Somdej Wat Rakang Kositaram of Somdej Dto, and are classified within the pantheon of amulets found in the Kru which are attributed to him. The Muan Sarn Sacred Clay of this Pristine and highly attractive exhibit is extremely time-hardened, and has a stone-like appearance, of an ancient amulet that is full of character. The amulet is considered an Ongk Kroo Reference Study Amulet, for the fact that it possesses all the expected features, and identical aspects, to the Sacred Clay found in the Pra Somdej Wat Rakang, of Somdej Pra Puttajarn (Dto) Prohmrangsri. The amulets of the Kru Wat Tap Khaw themselves are older than even the Pra Somdej of Somdej Pra Puttajarn (Dto) Prohmrangsri, of Wat Rakang Kositaram (first two of three consecutive finds/batches), and are reference study amulets for students of the lineage of amulets of Somdej Pra Puttajarn (Dto) Prohmrangsri and Ajarn Saeng. This amulet can in every sense be considered an 'Ongk Kroo' (teacher model), for reference study of the Pra Somdej Wat Rakang amulet, for the following reasons; 1. 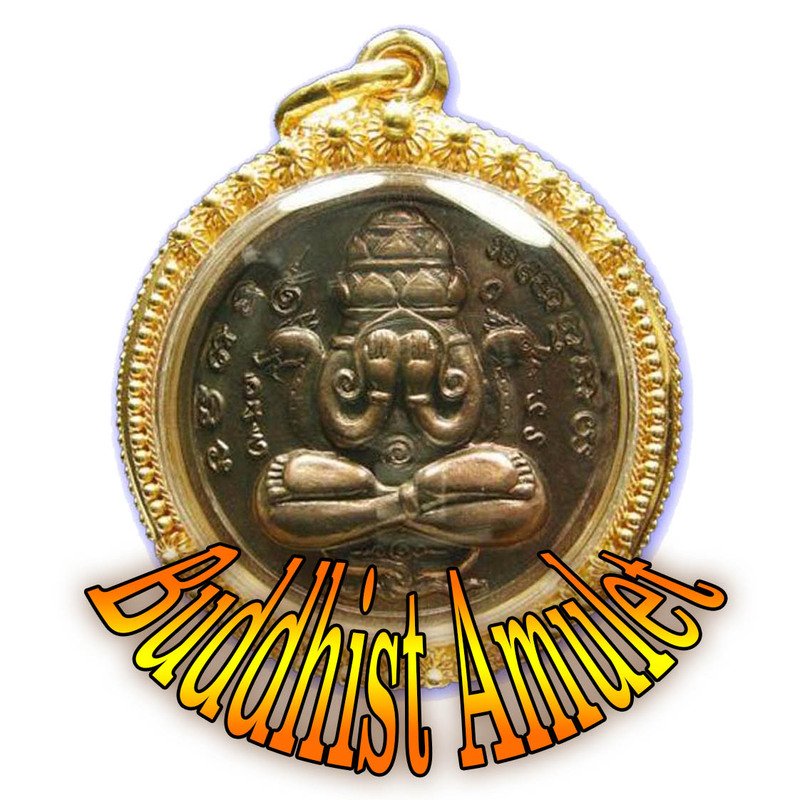 The amulet was almost certainly made by Somdej Dto Prohmrangsri, 2. This amulet is older than the Pra Somdej Wat Rakang, and hence is a good teacher as to how sacred clay that is more than 150 - 200 years old should look under the eye loupe. 3. The Muan Sarn Sacred Clay is almost identical in its appearance and ageing characteristics as the Pra Somdej Wat Rakang. When all aspects of these amulets are considered and the amulets themselves are examined in all their aspects, it is the common conclusion with experts that the Great Somdej Pra Puttajarn (Dto) Prohmrangsri of Wat Rakang Kositaram must have played a part in their making. Somdej Pra Puttajarn (Dto) Prohmrangsri is known to have hidden amulets in temples around the country, mostly in Central Thailand and in the North, and the amulets themself do not differ in 'Nuea Ha' (content), to the Pra Somdej Wat Rakang Kositaram. This makes the amulets of course a perfect reference study teacher model (Ongk Kroo) for training the eyes to recognise a true ancient Pra Somdej Wat Rakang Kositaram amulet. One thing to notice about amulets of thie age, is that they were hand pressed, and that close study of the features of the design will reveal hand pressing, through the variations of depth and contour which arise from the hand using varied levels of pressure with each different press. Modern amulets (and fakes of ancient ones), tend to use machine pressing methods in mass, which results in every single amulet looking identical in its features. Precisely the opposite is true of hand pressed amulets. The Muan Sarn Sacred Powder clay of the third later Era group of amulets, do not have the same agédness or appearance to its substance as the previous two batches mentioned, and have a much younger appearance in the features of the sacred clay. Some amulets even copied the Pim Song (models) found in the previous two eras of amulets found in the Kru, which caused suspicion about this third batch. 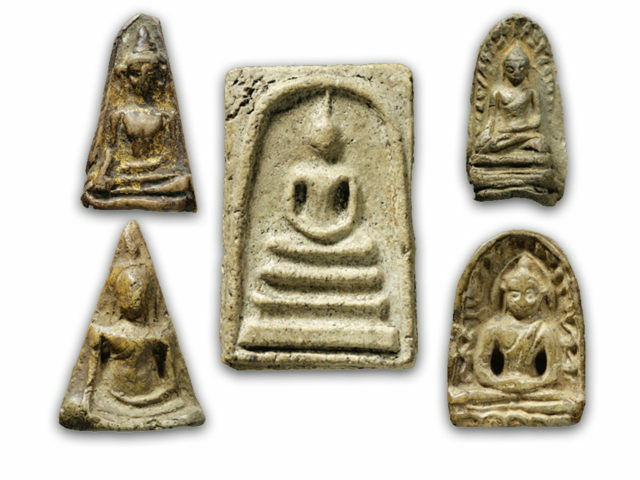 The inner circle aficionados of this series of Hiding Place Amulets have various beliefs depending on which group of aficionados; The main group assume that it was the Great Khrua Ta Saeng, of Wat Mani Chonlakhant in Lopburi who made the first batch during the time or Rama the 3rd. Khrua Ta Saeng was the Kroo Ba Ajarn of the Great Somdej Pra Puttajarn (Dto) Prohmrangsri, who encountered him on Tudong forest wandering in the Ayuttaya region. The very same models (Pim Song) of amulet which were found in the Kru Wat tap Khaw are mentjuoned in this documentation as having been made by Somdej Dto, and so there is little doubt remaining in the origins of the second era batch of the Kru Wat Tap Khaw. Below; The written documentation from Luang Phu Kam regarding Somdej Pra Puttajarn (Dto) Prohmrangsri's involvement in the Kru Wat Tap Khaw amulets.